Gorgeous, natural (unpolished) piece of Black Tourmaline (Schrol) with chakra cabochons all set in 925 sterling silver . There are many different colour Tourmalines available and they all have specific names, for example Blue Tourmaline is Indicolite, Pink is Rubilite, Green is Verdilite and Black is Schrol. Black Tourmaline is excellent at guarding against negativity of any kind, whether electromagnetic as from your computer, TV or strip fluorescent lighting, psychic attack, people wishing you ill or even from dark spells - it is an all round 'Champion against the Dark'. 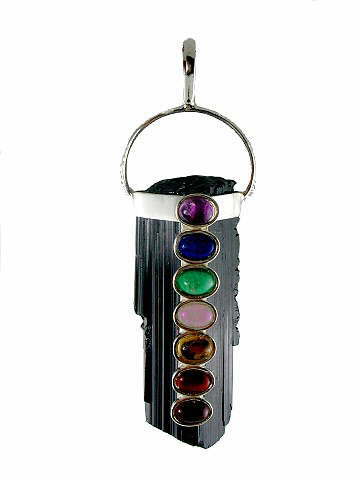 Where energy has been drained from you through any kind of negativity, Black Tourmaline grounds this dark energy and restores vitality. It disperses tension and stress and is therefore useful to wear or have around in any stressful situation, albeit at home or in the workplace. It is also said to help strengthen a compromised or weakened immune system. We have one of these pendants left. Due to the unique nature of rough Tourmaline crystals, each varies slightly from the next and will, therefore, differ slightly from the one shown, but they will all be of equal quality.